Right, so I am SO keen to hit number 700 whilst in Japan that I might have gone a bit crazy on this Saturday in September. It might have helped that I had a good friend with me to spur me on and translate the Mandarin in my favourite Chinese supermarket. Also, there was a Wholefoods and a dim sum restaurant involved. I am not sorry. Broke, but not sorry. Right, so I never got this before since whenever I see the name I instantly have the image of a conger eel come into my brain… and they are scary and violent bastards. 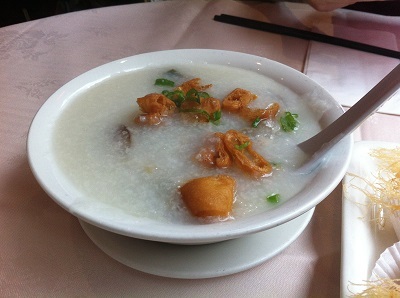 Congee is nothing like a conger eel. In fact, this gloopy rice soup was really nice. I liked the way that it took on the flavour of whatever spices were found at the bottom (in this case ginger). As for the egg (since this is the same thing with two different names) it was really jellyfied and a rather off-putting colour. Tasted fine though. On the menu these dumplings were listed as Shanghai dumplings. I have had these a lot of times before, but after a bit of Chinese character matching I know I have had these. 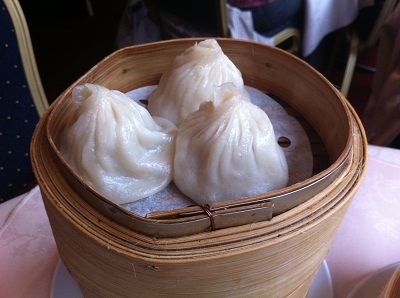 Compared to other dumplings I have had the pastry was just that bit thicker. Also, something I found weird, was that due to the steaming a decent amount of fat(?) came out when you broke the pastry. The vinegar dipping sauce was nice. 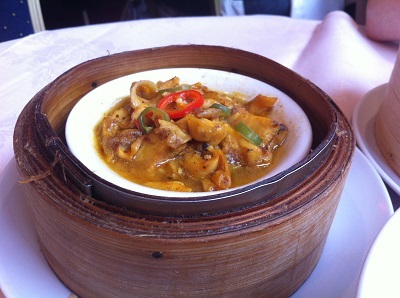 Since this is the place I had tripe in, I figured why not go for the whelks in satay sauce? They were really nice! They had the taste and consistency of baby octopus, just without the head that falls off in your mouth. I am not a coffee drinker. At all. 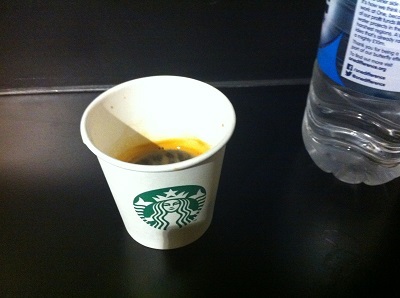 Yet, I liked the espresso. 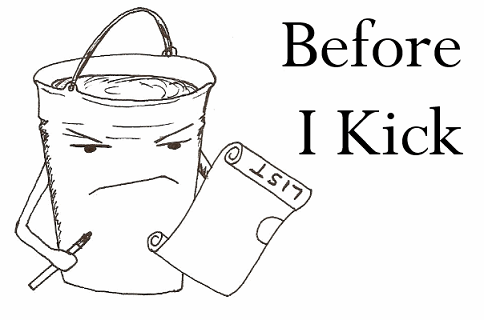 I mean, yes is was a bit bitter. However, after a while I was able to discern some sweetness in the aftertaste and it went down incredibly smoothly. I did not, however, get the rush I expected. Maybe years of Pepsi addiction have raised my caffeine tolerance to ridiculous levels. 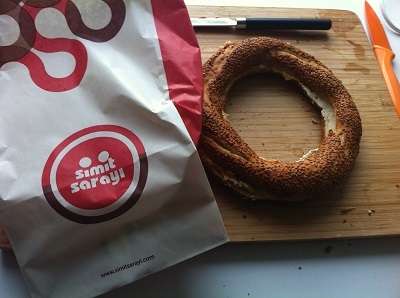 I had never heard of simit (or Turkish bagels) until today. Apparently this is a new chain to London? All I can say is, yes please. I got a plain one and spread some peanut butter onto it. To be fair, it is one of those things that would probably be good with any filling. It’s like a bagel crossed with a pretzel. Very happy this could be on the rise. With the black cod and saiko miso there was a sweetness and sharpness that I imagine was down to the miso-based marinade. The mirin, that I am assuming was used, probably leant the sweetness. The fish itself was juicy, fatty and flaky. In places it was a bit more jellylike… which might mean that I undercooked it. One reason this marinade worked so well is because it cuts through the fattiness of the fish so well and balances out the taste. 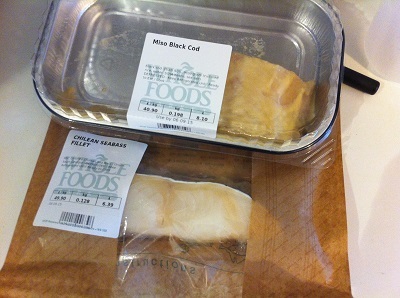 The Chilean sea bass (or Patagonian Toothfish), on the other hand, had a very different texture to the black cod. On the whole it was a bit drier, to the point where I can imagine it being really good in a fish pie. There was some natural sweetness to it too, one that meant that this was good to eat without ANY extra flavouring. Let’s start with the durian. I have no picture because it stank, I can actually see why the Chinese supermarket has a bit of a weird smell – there are people preparing durian meat in the back. The only thing I can compare durian to is cheese. The pungent smell a is complete curveball since the fruit is creamy and has a subtle taste. It didn’t have a great after taste though. The asian aubergine? Well, it was very much like a standard Mediterranean aubergine just not as rubbery. Plus, it did not soak up oil like a sponge or brown the moment I cut it with a metal knife. 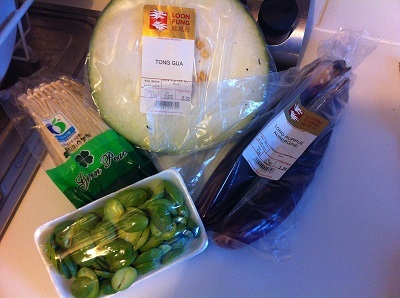 The petai bean was nutty, but, like the durian, pungent. I can only describe the taste as nut mixed with garlic acid. In small doses they were nice, but they did make the tongue tingle a lot. I had to properly brush my tongue before that sensation went away. This leaves me with my two favourites of this bunch of vegetables. Enoki mushrooms and winter melon. I love enoki mushrooms, they are easily one of my favourite mushrooms, and that is not because they look like a miniature citadel when clustered together or weird alien penises when on their own. These are really something to have in a soup or raw, they lose their slight give and some of their flavour disappears. A pity, since the flavour is on the sweeter end of the mushroom spectrum. One of my finds of the day was winter melon. A curious case of a fruit (because this is actually a melon) that is cooked as if it was a vegetable. If you can think of cucumber without the irony taste and cross that with the texture of a watermelon you kinda have it. When I stir-fried it there was an almost a melting texture to it, and then there were some pieces that were crisp and fresh. Might have to get more of this soon, it was probably the cheapest thing I bought today other than the coffee and the simit.